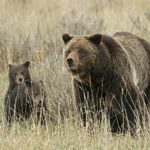 Home / Posts Tagged "grizzly trophy hunt"
The conflict over whether Yellowstone grizzly bears should be off or on Endangered Species Act protections has been an ongoing controversy for years. Even after a judge put grizzlies back under federal protections this Fall, the debate continues. So far in this young century, few wildlife conservation issues have galvanized more Americans than whether or not Western state governments ought to allow grizzly bears to be hunted again.